ALCHEVSK, Ukraine -- When he joined the separatist insurgency in eastern Ukraine, Russian businessman Bondo Dorovskikh thought he would be fighting hordes of fascists bent on victimizing the local population. 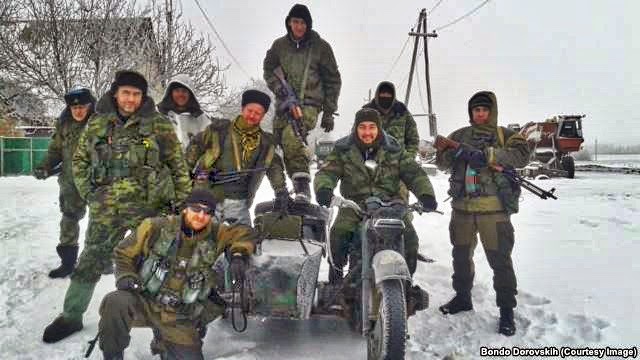 Russian volunteer fighter Bondo Dorovskikh and friends. "In the morning the commander would get up and line up the insurgents for the roll-call, and in the evening there were another roll-call," he told RFE/RL. "The rest of the time the militants roamed around Alchevsk, pillaging, stealing scrap metal, removing metal gates and selling them to buy alcohol and cigarettes. Some of them would get drunk and fire at each other." Dorovskikh recently returned from his six-month stint with the insurgents, feeling angry and cheated. Like many other volunteers, he decided to take up arms after watching Russian television reports that portrayed Ukrainian forces in the country's east as neo-Nazi thugs persecuting and slaughtering Russian-speaking locals. "Reports from the Rossia 24 channel on the latest news in Ukraine were constantly on my mind," he says. Dorovskikh contacted the insurgency through its recruitment office in Moscow, where he was given a mobile phone number to call when he reached the southern city of Rostov, close to Ukraine's border. He left his job in Moscow and purchased ammunition, a bulletproof vest, and a one-way ticket to Rostov. He then called the number he had been given in Moscow and received instructions on how to reach the group that would take him to Ukraine. He was stunned to find out that recruiters in Rostov did not bother asking about his military experience and failed to conduct even basic identity checks on anybody. "There were people there who didn't have any documents at all," he says. Another incident soon confirmed his misgivings about the insurgency. "The first thing we saw after crossing the border, literally five minutes later, was a brawl between two insurgents," he says. "I immediately understood where I had landed, that this had nothing to do with an army. I was disappointed right from the start." Dorovskikh was assigned to the "Ghost" battalion and sent to a unit in Alchevsk, where he was immediately handed weapons. He says the unit was comprised of local militants, Russian volunteers, several Russian army officers, and a handful of foreign recruits from Spain, Italy, and France. But Dorovskikh never witnessed any combat in Alchevsk. He received no training, either. According to him, the vast majority of militants have no interest whatsoever in politics and only join the insurgency to enjoy the salaries and material advantages granted to its members. He describes them as "bandits" and says some of the local militants in his unit were convicts who were hunting down former police officers ousted when the separatists took over. He says rebels also routinely turned against their own comrades-in-arms. "Robberies and murders took place there," he says. Dorovskikh's account also corroborates reports that Russia is supplying the insurgents with weapons. Militants who crossed over from Russia, he says, are particularly well equipped. "We had everything, we were fully equipped," he says. "We had grenades, machine guns, grenade launchers and ammunition for them, absolutely everything. We even had two cars at our disposal." He also confirms that the tanks spotted in eastern Ukraine come from Russia and describes seeing tanks being sent into Ukraine from the Rostov region. "They gathered volunteers who had served in armored divisions in the army," he says. "They were trained at a tank training base near Rostov, units were formed, they were also given weapons. These tanks were transported to the border, which they then crossed on their own and headed directly to the hotspots." What he witnessed there only fueled his disillusionment. He says that the fighters had no clear instructions and that the tank radios did not function, resulting in chaotic battles. He says the insurgents also took part in shocking acts of cruelty against Ukrainian soldiers. He recalls hearing the screams of Ukrainian soldiers on the radio as rebels torched their tanks with the men still inside. "I felt sorry for those on the other side who were being slaughtered," he says. "And they were being killed by cutthroats who don't even care against whom they are fighting." Dorovskikh says he is not an exception. Disenchanted Russian volunteers, he claims, are streaming back home. He is himself so upset that he is mulling enrolling in Ukraine's National Guard to help stamp out the separatists. But for now, he has a message for all those still tempted to join the insurgency. "Don't go there," he urges them. "We are told on television this is like the Second World War, but in fact it's an act of pure aggression. This is not a war that's worth risking the most precious thing you have."